Are you thinking about buying a home in a gated community, but wondering whether or not it’s right for you? You may be asking yourself if its safer or whether or not the home will retain its value better when its time to resell. Here’s a look at what you need to know so that you can make an educated decision. When it comes to security, the perception is that gated communities offer homeowners a greater level of protection against crimes such as burglaries. But you also need to consider how easy it is to get inside the gate. Is the gate manned or unmanned? Is the gate often left unlocked? Are the codes to the gate well known because neighbors give them to dog walkers and pizza delivery people regularly? In 2005, the Orlando Sentinel reviewed the sheriff’s reports for more than 1,400 Florida homes. What they discovered is that rates of residential burglaries and stolen cars were reported at almost exactly the same rate in both gated and ungated communities. Cases of vandalism were reported at slightly lower rates in gated neighborhoods. If safety is your main concern, gated communities don’t offer significantly higher protection from crime. A reduction in traffic is definitely an area where gated communities perform better than neighborhoods without gates. The gates deter using the community as a thoroughfare and since the gate forces cars to slow down, traffic is usually slower and quieter. If you have kids that like to play outside and ride their bikes, gated communities make it safer for them. Be prepared to pay a higher price for a home within a gated community. These properties are usually part of a Homeowners Association (HOA), which collects fees to pay for maintenance of the streets, gate, landscaping and other community amenities. You can expect to pay hundreds or even thousands more in fees over the years. Gated communities are attractive to some buyers because they come with an air of exclusivity. Many communities enforce strict codes of conduct that everyone living within the gates must follow, and you may or may not like this depending on your tastes. There may be restrictions on what colors you can paint your home, where you can park your vehicles and how long you can have guests stay with you. Some people enjoy living in a community where everyone is following the same guidelines, while others find this type of environment too restricting. Convenience – or maybe lack thereof – should also be a consideration when deciding whether or not to buy in a gated community. 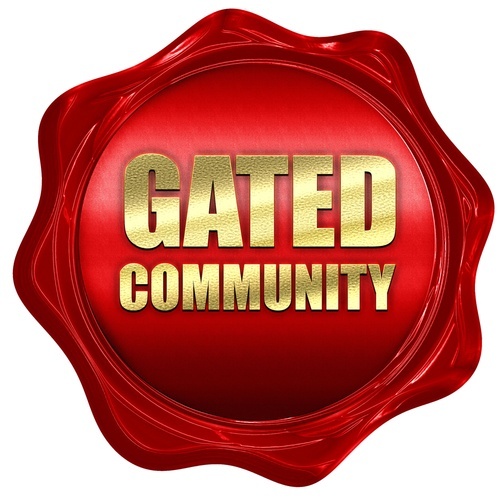 If the community has a manned gate, you may sometimes have to wait in line to be let in. It can also be an inconvenience to any guests you may have, as they will possibly have to check in at a gate or be buzzed in by a resident. There may also be restrictions on the number of parking spaces allotted to guests. In the end, only you can decide if a gated community is the right choice for you and your family. By knowing ahead of time both the pros and the cons of living in this kind of neighborhood, you’ll be better able to make that choice when the time comes.